Michael Massonne, Department of Public Works Indianapolis North Flood Damage Reduction Project Manager, indicates levee and floodwall construction should be completed by spring 2019, with levee certification and accreditation “hopefully” completed by spring 2020. – The levee meets the requirements of 44 CFR, Section 65.10. – The analyses are performed correctly and in accordance with sound engineering practices. This documentation is provided to FEMA to demonstrate that a registered Professional Engineer certified the levee and meets the specific criteria and standards to provide risk reduction from at least the one-percent-annual-chance flood. Once the levee meets the other requirements of 44 CFR 65.10, FEMA can accredit the levee and show the area behind it as being a moderate-risk area on a Flood Insurance Rate Map (FIRM). If a community or levee owner wants the area behind a levee to be shown as reducing risk from the one-percent-annual-chance flood, they must first complete the process for having the levee certified. How is a Levee Certified? To certify a levee, the community or levee owner must work with a licensed engineer or a Federal agency responsible for levee design to develop and certify documentation that the levee meets design construction standards for at least the one-percent-annual-chance flood. Levee certification does not warrant or guarantee performance, and it is the responsibility of the levee owner to ensure the levee is being maintained and operated properly. What is Accreditation? A levee cannot be accredited until the certification process is completed. FEMA accredits a levee as providing adequate risk reduction on the FIRM if the certification and adopted operation and maintenance plan provided by the levee owner are confirmed to be adequate. An operations and maintenance plan specifies key operating parameters and limits, maintenance procedures and schedules, and documentation methods. FEMA’s accreditation is not a health and safety standard – it only affects insurance and building requirements. An area impacted by an accredited levee is shown as a moderate-risk area and is labeled Zone X (shaded) on a FIRM. In this case, the National Flood Insurance Program (NFIP) floodplain management regulations do not have a mandatory flood insurance purchase requirement. However, FEMA recommends the purchase of flood insurance due to the risk of flooding from potential levee failure or overtopping. If the levee is not accredited, the area will be mapped as a high-risk area, known as a Special Flood Hazard Area, or SFHA. In this case, the NFIP floodplain management regulations must be enforced and the federal mandatory purchase of flood insurance applies. The Indianapolis North Flood Damage Reduction Project (“project”) seeks to protect from the consequences of a severe flood event approximately 2,500 homes and 5,000 individuals. A recent engineering study shows over five feet of floodwater would surround a representative flood plain home in such an event and, unfortunately, we see such events becoming increasingly common. The catastrophic October 2015 floods striking South Carolina will go down in the history books, not only because of the lives they’ve taken or the destruction they’ve wrought, but also because of the sheer amount of rainfall . The historic and unprecedented December 2015 flooding in Illinois and Missouri caused governors to declare states of emergency across wide swaths of their states, and officials blame 20 deaths on the floods . Only the grace of a weather pattern spared Indianapolis North flood plain residents from a similar fate. The City of Indianapolis now seeks to complete the next project phase using the “Westfield Boulevard Alternative”  and approximately $10 million in federal funding recently made available. We applaud and support the City’s decision to move forward this long, languishing 20-year public safety project, and its attempt to provide basic flood protection to those citizens and constituents it now can. We do understand the Westfield Boulevard Alternative does not reduce the potential for flood damage to approximately 350 Rocky Ripple homes and their 700 residents, and hope the search continues for appropriate mitigation measures. Those who oppose project progress at this time also now widely disseminate information of a biased or misleading nature in order to promote and publicize their point of view. We fear these organizations may continue to release and repeat such information and believe doing so substantially harms this important public policy debate. We accordingly address this information. It is inconsistent for these organizations to now ask the City to delay project progress because the project at this time does not provide Rocky Ripple flood protection, when shortly prior, they asked the City to delay the project to pursue an alternative that similarly failed to provide Rocky Ripple flood protection. Midtown Indianapolis, Inc. indicates the Westfield Boulevard Alternative is “nearly universally opposed” . It is hard to understand how Midtown Indianapolis, Inc. reached this conclusion. On January 4, 2016, Midtown Indianapolis, Inc. received by e-mail from SaveWarfleigh a copy of a petition, which now has nearly 1,000 signatories, urging expeditious project completion . Midtown Indianapolis, Inc. also received at this time copies of constituent letters supporting project completion. Additionally, Midtown Indianapolis, Inc. should be aware of the hundreds of signs urging project support now appearing in the yards of homes in affected neighborhoods. Finally, simple intuition should suggest to Midtown Indianapolis, Inc. that at least some, if not the majority, of the 2,500 homes and 5,000 individuals this project seeks to protect actually support the project. It is difficult to conclude the project is nearly universally opposed in light of this demonstrated and wide-spread support. (a) Recent changes in the terms and conditions of the national flood insurance program impose precipitous increases in annual premiums for flood insurance upon affected homes and businesses. The Warfleigh Neighborhood Association recently reports an annual cost to a homeowner for flood insurance in the range of $8,000 per year. Of course, we do not know average rates, but using a much lower estimate of $4,000 per year, and applying this to the approximately 2,500 homes and businesses in the area for which flood insurance is or will be a requirement, suggests nearly $10,000,000 dollars a year in flood insurance premiums now flow out of the local economy . It is difficult to understand how a project delay of an indeterminable length that drains annually from the midtown Indianapolis economy $10,000,000 in purchasing power would contribute to the economic health of this area. More likely, delaying the project and removing from midtown Indianapolis such purchasing power impairs the economic health of midtown Indianapolis. (b) Project opponents sometimes seek to dismiss project advocates as individuals solely interested in property values and annual flood insurance premiums. This of course is not the case. Nevertheless, if completing this project phase does increase property values in the affected areas, then this positively contributes to the economic health of midtown Indianapolis. Rising property values create a wealth effect that induces additional consumption and spending . The local economy benefits as households consume and spend more. Rising property values lead to increasing property tax assessments. Increasing property tax assessments increases local government revenue. Increasing local government revenue increases the ability of local government to provide public services that benefit both businesses and residences, increasing the economic health of a community. Those opposed to the Westfield Boulevard Alternative previously indicated the City should not move the project forward using this alternative because of concerns related to the safety and integrity of the City’s water supply system. The City dutifully addressed these concerns and the City now will assist Citizens Energy Group with the construction of a supplemental water intake system. Importantly, Citizens Energy Group indicated in a recent stakeholder meeting that construction of the supplemental water intake system is an important system improvement and upgrade, regardless of whether it is completed in conjunction with the levee and floodwall project. That is, in and of itself, the supplemental water intake system contributes to good utility design and practice: (1) the supplemental water intake system will increase the ability of the utility to meet peak demand, and (2) the supplemental water intake system will provide the utility with an important source of redundancy. Those who previously expressed concerns regarding the safety and security of the City’s water supply system should welcome this important system upgrade and improvement. Midtown Indianapolis, Inc. characterizes this as disturbing news . 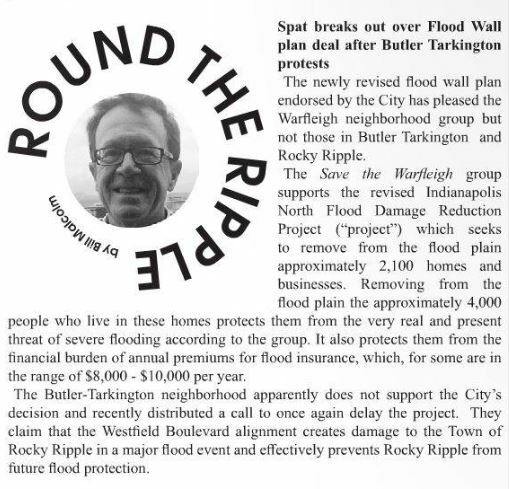 The Butler-Tarkington Neighborhood Association in a recent (2/28/16) letter to Butler-Tarkington residents highlights the potential for purchasing flood insurance on the private market because doing so currently confers a cost-advantage relative to insurance purchased through the national flood insurance program. Unfortunately, neither private market flood insurance nor insurance purchased through the national flood insurance program protects a home from the five feet of floodwater that would surround the home should a significant flood event occur. Conversely, completing this project phase using the Westfield Boulevard Alternative will protect affected households from floodwater that otherwise would surround their home. Furthermore, while private market flood insurance now may offer cost savings relative to other alternatives, this cost advantage may or may not persist over time – especially after the first occurrence of a significant flood event. Simply, if insurance products are like other products, then we may expect the rates for these two similar products protecting against similar risks to converge over time with any initial cost differences dissipating. Midtown Indianapolis, Inc. indicates completing the current project phase using the Westfield Boulevard Alignment will bifurcate Holcomb Gardens. The Corps of Engineers identified Holcomb Gardens as a unique resource within the path of the Westfield Boulevard Alternative as early as April of 2009 and included it in their consultation under Section 106 of the National Historic Preservation Act with the Indiana State Historic Preservation Officer and other consulting parties. Based on the Westfield Boulevard Alternative design, only the eastern side of Holcomb Gardens would be affected if the Westfield Boulevard is selected as the proposed action . The Indianapolis North Flood Damage Reduction Project seeks to protect approximately 2,500 homes and 5,000 individuals from the devastating consequences of severe flood events which increasingly are becoming more common. We applaud and support the City’s decision to move forward this long, languishing 20-year public safety project, and its attempt to provide basic flood protection to those citizens and constituents federal funding now allows. 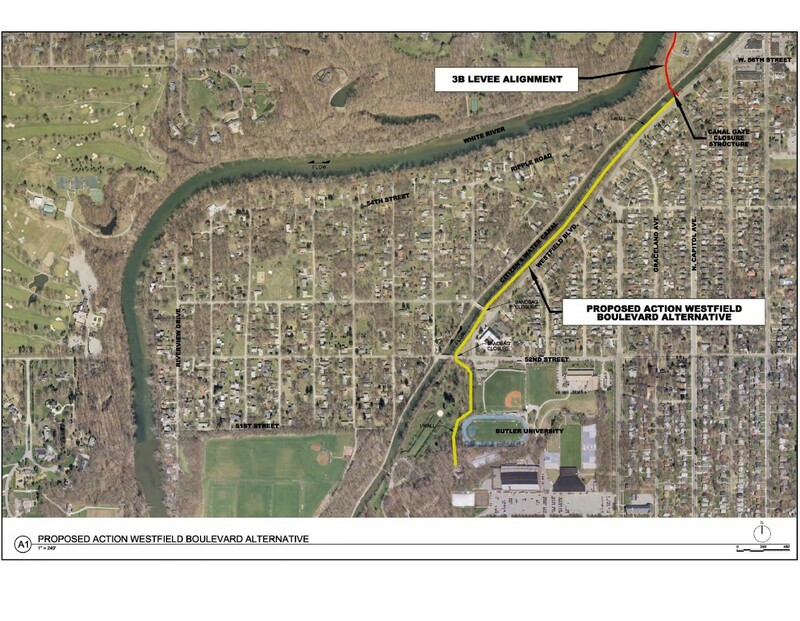 We do understand the Westfield Boulevard Alignment does not reduce the potential for flood damage to Rocky Ripple. However, we also understand terminating project progress similarly fails to reduce the potential for flood damage to Rocky Ripple. Alternatively, terminating project progress at this time imposes considerable cost upon approximately 2,500 households and 5,000 flood plain residents, and impairs the economic health of midtown Indianapolis. Accordingly, the suggestion to halt project progress imposes extreme hardship and cost upon many and, at the same time, provides benefit to no one. A more reasonable strategy would be to support project progress now while continuing to search for a viable Rocky Ripple solution. Those who share this perspective should take this final moment to consider sending a letter or e-mail to the City thanking the City for its decision to move forward the Indianapolis North Flood Damage Reduction Project and indicating your support for the Westfield Boulevard Alternative. the FinishtheFloodwall sign drive has similar effect. On behalf of the board of directors for the Broad Ripple Village Association (BRVA), I thank those who reached out to the organization to express their thoughts regarding the Ballard administration’s selection of the Westfield Blvd. Alignment and its decision to proceed to find funding to complete the construction of Phase 3B of the Indianapolis North Flood Damage Reduction Project. In 2012 the BRVA recorded its position with the U.S. Army Corps of Engineers and City of Indianapolis as “withholding support” for the Corps recommended Westfield Blvd. Alignment due to “Concerns raised about the safety of Rocky Ripple residents, the gross clear-cutting of trees, the risk to the City of Indianapolis’ drinking water supply, and the walling off of neighborhoods.” During that time many issues were still under evaluation. Neighborhoods and environmental preservation organizations were examining options to preserve trees along the levee, as there seemed to be legal precedent in other areas of the country that trees could be saved. Groups were exploring the possibility of partial certification for the existing length of the flood wall, as well as, digesting the possibility of a sixth alternative alignment that, if feasible, could protect the City’s drinking water supply and lessen several southern neighborhoods’ concerns about being “walled off”. The City and the Corps both confirmed that funding Phase 3B was not in hand and that they couldn’t speculate when funds may be found as funding for these sorts of projects are difficult to come by. Believing that the City and Corps should evaluate every possible option to protect and preserve neighborhoods, we, the BRVA, in consensus with other affected Midtown neighborhoods, asked the City to study this sixth alternative, which was coined the Canal West Bank Alignment. The city agreed to fund the study. On December 9, 2015 the Ballard administration announced it would support the Corps recommendation to complete the Westfield Blvd. Alignment, citing study results that deemed the Canal West Bank Alignment infeasible. The study document was edited on December 18, released to the public on December 28, and the Ballard administration left office on December 31. The BRVA board discussed the announcement and study findings at its January 5, 2016 board meeting and determined a course of action. As residents and business owners of the Village ourselves, we are your neighbors. We share your interests and your desires to make the Village a safe and prosperous neighborhood and Cultural District. Please find our letter to the Hogsett administration attached, calling for his attention to the flood wall issue and asking for his help in completing the flood wall.